Hope no one minds an early “Sunday” post this week; I’m off to Germany in the morning, and was worried I might miss the deadline otherwise. Plus, it’s the fortieth anniversary of Woodstock today. How apropos, right? 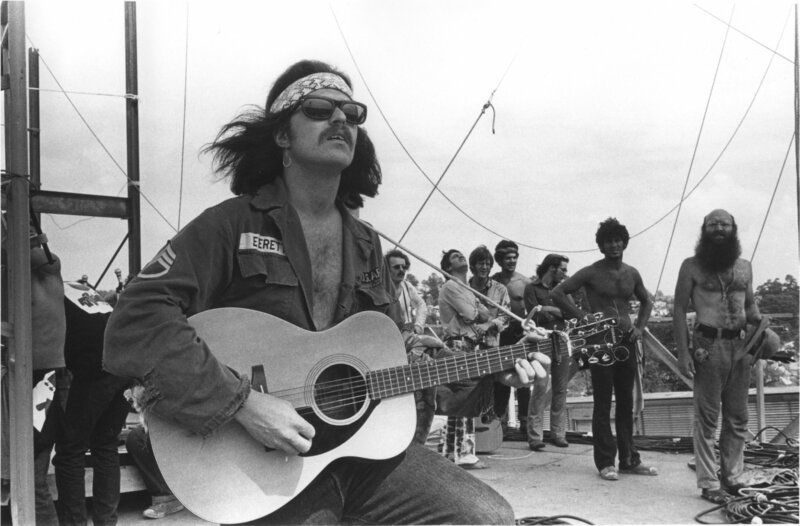 Though the statistics on blog readers tell us that the majority of our readers were conceived after the summer of love, there’s no denying the myriad ways in which both the Woodstock generation and the 1969 Woodstock festival have shaped our collective musical landscape. As a generational touchstone, Woodstock holds a unique place in the annals of formative gatherings; as a musical map, the odd collection of genres and artists which took the stage over the course of the festival tell a tale of a society in transition. 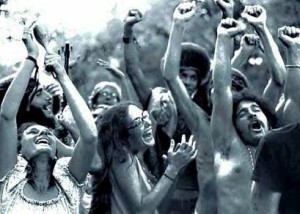 Of course, it’s a no-brainer to say that Woodstock was as much a product of its culture as it was a producer of it. There’s little we can add to the huge volumes of history, ethnography, and paean which pepper our cultural landscape, connecting past and future through the focusing event. But a quick look at Woodstock though the lens of coverfolk is interesting nonetheless. Though the number of pure folk musicians at the festival was limited, the complete set list for the three day celebration of love, mud, and music reveals a number of traditional folk and protest songs – an unsurprising development, given the nature of the times, and of the crowd. More recently written songs of love, harmony, and struggle from the world before and beyond Yasgur’s Farm pepper the list as well, from Dylan and The Beatles to Sam Cooke, Merle Haggard, and even Elvis. That the range of coverage exhibited at Woodstock is in many ways perfectly typical of the spectrum of coverage in modern culture is both validating and liberating. As a folk blog, we’ve long maintained that the primary purpose of coversong is to strengthen the connection between community and culture — that at its most powerful, coverage is a kind of folkways in action, a celebration of ourselves as a collective. At Woodstock, then, like everywhere else except perhaps moreso, covers served as part and parcel of the larger tribute to the rich soundscape that makes us common folk in a common culture. Indeed, from our own tiny vantage point, we might suggest that it is this very refocusing of common song in the context of change which makes Woodstock so meaningful, so worthy of our collective memory, forty years on. To demonstrate the continued relevance of song and moment alike, here’s a larger-than-average set of relatively recent covers of songs also covered at Woodstock. PS: If you’re looking for Janis Joplin, there’s a full set of modern covers of Summertime here in the archives. Cover Lay Down posts new coverfolk features Sundays, Wednesdays, and the occasional otherday. Coming soon: I go to Germany, and post more Bob Dylan.